1 of 5 Heat oven to 350 degrees F. Grease 3-quart casserole. 2 of 5 Spread almonds in even layer on baking sheet. Toast in 350 degree F oven for 10 minutes, stirring occasionally. Remove baking sheet from oven. 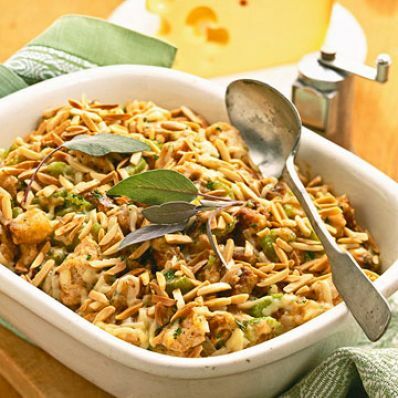 Leave oven at 350 degrees F.
3 of 5 Stir together the onion, celery, croutons and shredded Swiss cheese in a large bowl. 4 of 5 Cut turkey cutlets into bite-size pieces. Stir into onion mixture in bowl. Stir in Alfredo sauce. Spoon mixture into prepared casserole. Cover with foil. 5 of 5 Bake in 350 degrees F oven 45 minutes. Uncover. Sprinkle toasted almonds over top. Bake, uncovered, for 15 minutes. Let casserole stand for 5 minutes before serving.